The colder weather not only dries out my skin but can also interfere with make-up application, I often find that my foundation is more difficult to blend and sits on top of my skin. Bases that were once flawless suddenly become prone to caking and looking heavy, which is of course far from the desired effect I was hoping for. If you are in a similar position and on the look out for a product that will not only prolong the wear of your foundation, aid application but also give an air brushed finish your next purchase should be Topshop Beauty Airbrush Primer. "Create a flawless base with the Topshop Beauty Airbrush Primer. With photo-reflecting particles to give you a glow, this silky skin refiner blurs imperfections and erases the appearance of pores in an instant. Wear alone for a radiant natural look or under foundation for a flawless finish." Not so long ago Topshop Beauty expanded their cosmetic line up, adding a pro-line to the already expansive range. The pro-line focuses on creating a flawless, photogenic finish and offers primers, concealers, foundations and BB Creams. The packaging has a slightly more up scale and expensive feel, it would slot nicely into the likes of Space.NK let alone Topshop. You would be forgiven for assuming that this primer retails for a lot more than £12. Like most perfecting primers this has a silky, silicone based texture but on the plus side this is far lighter and more gel based than the likes of Benefit Porefessional et al. 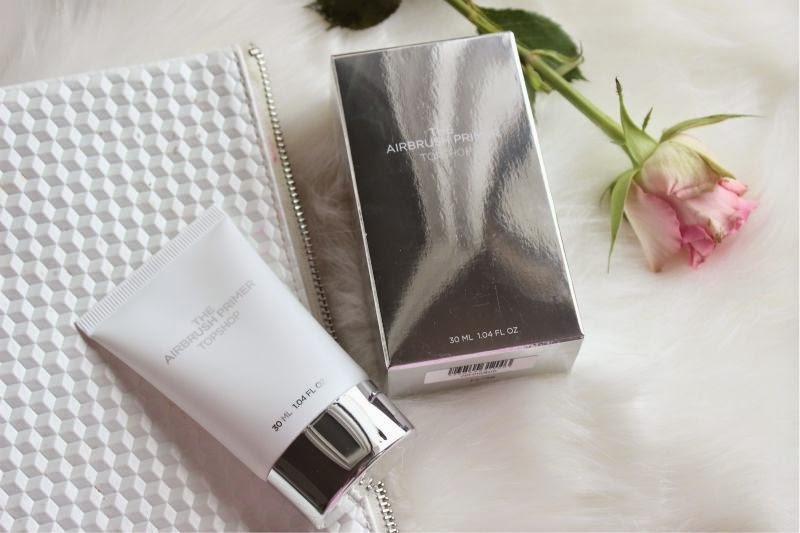 To a degree the Topshop Beauty Airbrush Primer is hydrating but it won't overwhelm oily complexions, rather it soothes, cools and primes in one quick step. 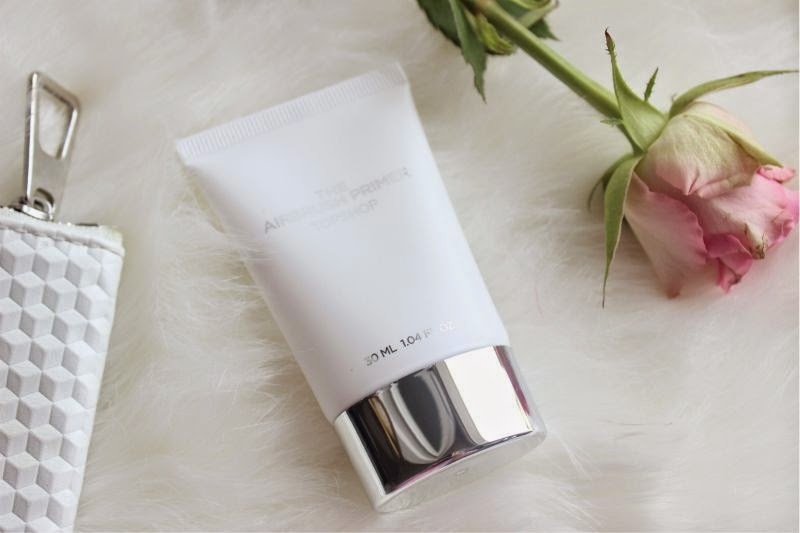 The reason I rate this primer highly is that along with instantly optically blurring skin imperfections such as enlarged pores, fine lines and more, all the while creating a flawless base; it also aids the application of any product applied on top so much easier. Foundation glides on to the skin be it cream, liquid or powder - you don't have to buff/blend as thoroughly as you would without it. Essentially it does the work for you. As someone with currently combination skin (an oily t-zone and dry areas on my cheeks) - this primer hydrates dry areas resulting in less caking of product all the while controlling excess oil without stripping the skin. 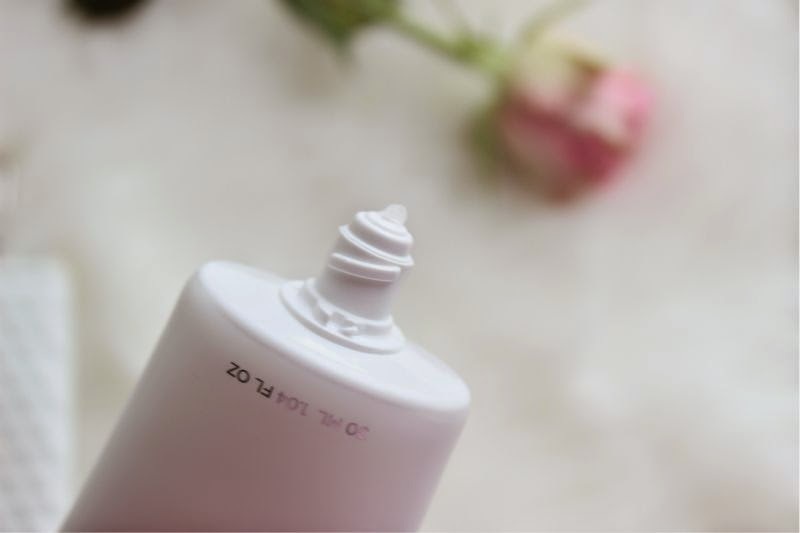 Topshop Beauty Airbrush Primer really is a do it all primer; although intended for the face I have trialled this on my eye lids and can safely say it did not irritate and did intensity the pigmentation as well as locking it in place. For £12 this is a great, multi-purpose, do it all primer and a wonderful addition to any make-up routine. Topshop Beauty Airbrush Primer £12 via Feel Unique - link. I've been looking for a new primer for a while so this might have to be my next one! I love Topshop makeup, but I haven't tried anything from their face range yet. I think i'll definitely give this a go - it sounds lovely. I never really knew what to think of Topshop make-up. 'Cause, ya know, it's Topshop make-up... But this actually sounds pretty good! These products all sound amazing. Actually love the sound and look of this! Was planning to buy a smashbox primer but this one is cheaper and sounds like it will do a great job! Looks amazing, slightly out of my budget though it does sound worth it if I had the money! Topshop makeup are a brand that has been underhyped as I find that their range is excellent in quality and the pricing is just right. This sounds like the Hourglass mineral primer... very nice! This sounds like a primer I need in my life. I've got a whole drawer of primers, none of which are helping my skin keep from looking flaky/cakey once my foundation is applied over top! Okay I'm going to give the primer a go, I love primers! Just curious, have you tried the Laura Mercier Foundation Primer and how does this compare to that? I am having the exact same problem, this weather is a complete nightmare not only is it giving me dry lips and my foundation just isn't blending right. Bring on summer! I currently use Mac's prep and prime, but I am looking for a cheaper option and I think this may be it so thank you. I haven't tried Topshop make-up before, but this sounds great! Wow, the primer sounds really good! The price isn't bad, either. This sounds great. I'll be trying it soon! Haven't come across this so definitely will be trying this out! I have loved the Topshop products I have used, it looks great especially as it's good for an oily t-zone like I have.